Whether it’s Earth or in orbit, we are experiencing one hell of an eWaste problem! Artist’s impression based on actual space debris data. Debris size is exaggerated compared to the size of the Earth. Our technology can get us to space, but once there, we still aren’t too flexible. 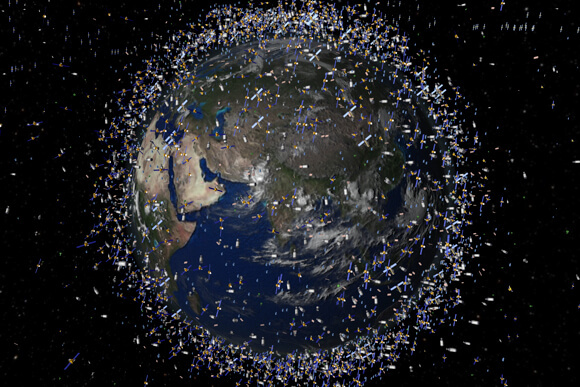 Earth orbit is clogged with debris because we simply don’t have an easy way to clean it up. According to the European Space Agency (ESA) there are 17,000 tracked objects in orbit (and a total of 29,000 objects greater than 10 cm) of which only 7% are working satellites. About ten objects a week pass within two kilometers of each other, and ESA initiates three collision avoidance maneuvers yearly.